I would prefer that the market set rates at the lower end as opposed to the Federal Reserve, again, except in times of crisis. I don’t believe 12 people sitting around a desk, no matter how brilliant and educated they are, can arrive at a proper market-clearing rate better than the market itself. Seriously, LIBOR was set for decades without government intervention. Yes, in times of crisis it got a little funky, but that is when you want the central bank to step in (and then get out as soon as possible). Following Fed policy has been whiplash-inducing over the last year. It was just two months ago that Jerome Powell set off a market panic by suggesting the FOMC would do what it thinks is right and let asset prices go where they may. They were promising at least two if not three more rate hikes in 2019. The stock market fell out of bed. Nassim Taleb in his book Antifragile argues that preventing small “crises” from happening on a regular basis eventually causes a very large crisis. It’s analogous to not allowing small forest fires to clear out undergrowth. Eventually you get one very large fire which is far more destructive. The Fed assuming a “third mandate” to protect asset prices is similarly dangerous. I think there is the very real possibility Powell wasn’t being tone deaf at all. He could have wanted to remind everyone that the Federal Reserve is independent from Wall Street as well as politics. Not long after indicating further gradual increases in rates were on the horizon, the US Federal Reserve two weeks ago made a mysterious U-turn and signalled that its hiking cycle was over for now. This perplexing decision led many to believe it was a response to red flags about the US economy. Doubtless, the global economy has slowed. But the various measures of US economic performance are almost universally strong. The latest ISM manufacturing survey rebounded smartly, indicating solid growth; retail sales have remained strong; inflation is near the Fed’s 2 per cent target; and the latest jobs report showed tremendous payroll growth, beating consensus expectations by a wide margin. The US economy is in rude health — recession fears were, and are, overdone. Jay Powell, the Fed chairman, pointed to factors such as slowing global growth, tighter financial conditions and geopolitical trouble. Yet on all three counts the world is more positive: stimulus measures introduced since last June should eventually stabilise China’s economy towards the second half of the year; the Bloomberg US Financial Conditions index is at its strongest in nearly three months; and negotiations between the US and China are reportedly progressing. It seems more credible that the Fed’s decision is predicated on two factors. First, lingering slack in the labour market. The January employment report highlighted that robust economic growth continued to pull workers back into the labour force, pushing the participation rate higher and keeping a lid on wage growth. It is almost inconceivable that the labour market is operating at full capacity yet. Second, a capitulation to markets; investors perennially talk about the “Fed put”, counting on the central bank to support equities by shifting to easier money when times get tough. There is method to the madness of the latter. Market tantrums can feed on themselves as confidence starts to plummet — self-fulfilling market meltdown. If financial conditions deteriorate significantly, negative market performance might weigh heavily on business investment intentions and consumer confidence. This script appeared to be playing out in December. Investors seemed to catch the idea that a recession was on the cards precisely because the stock market was going down. As the market stumbled, sentiment among business leaders dropped too. In December’s Duke CFO Global Business Outlook survey, nearly half of respondents said they thought the US would be in recession by the end of 2019, with 82 per cent predicting a slump before the end of 2020. The risk was that falling stock markets convinced business leaders that a recession was coming, and they began hunkering down to create the conditions to bring on a mild recession. Financial markets were at risk of not just being a leading indicator of recession, but a driver. We exist in the perfect climate for the next downturn to be the result of a collapse of confidence. At the time of the previous financial crisis there were approximately 300,000 tweets per day; 10 years on, there is more than this number in a single minute, or more than half a billion in a day. The echo chamber to amplify market anxiety has never been greater. The risks are significant. US corporate debt has reached record highs; a further deterioration in financial conditions could have quickly led to a sharp rise in corporate defaults, with clear negative repercussions for the broader economy. By allaying concerns over policy overtightening, the Fed has avoided this scenario — for now. It has unleashed “animal spirits”, greatly reducing the risk of a self-fulfilling meltdown in the near term. It is difficult tactically to be short risk assets; robust growth and a patient Fed is certainly a favourable mix. But as relief charges through equity and credit markets, there remains an inescapable fear that perhaps the Fed’s short-term support for an economy that was already in good health opens the door to a surge in volatility later in the year. A strong pick-up in growth from here is surely not desirable. If job gains continue, the labour market will eventually reach full employment. Higher operating and labour costs would follow, driving up inflation. Inevitably, the Fed would have to reverse its recent dovishness. But by patiently waiting to see higher inflation materialise before it kicks back into action, Mr Powell is also challenging the widely accepted view that policy rates act with a lag. The Fed would be on the back foot, forcing it to play catch-up by slamming on the brakes. Responding to rising inflation with a delay can be just as damaging as acting prematurely. It may not be easy for the Fed to resume rate hikes without risking renewed collapsing confidence, throwing markets once again into disarray. The equity market rally may have been extended but risk appetite will eventually be challenged again — and while the risk of a recession in 2019 is lower than it was two weeks ago, the risk of a recession in 2020 has now surely increased. The aphorism that “expansions don’t die of old age, they are murdered by central bankers” was written for times like these. Enjoy the risk ride while you can. The sharp rise in volatility in the final of quarter of last year led to lower capital ratios at several European banks according to recent financial reports. The cost in capital terms wasn’t huge, but it highlights the way that bank capital rules can exacerbate market wobbles by making banks even more wary of taking risk just as investors want help to unload assets or hedge their exposures. The next crisis in finance is more likely to be caused by a run on investment funds than by the kind of run on banks that took the last crisis global. 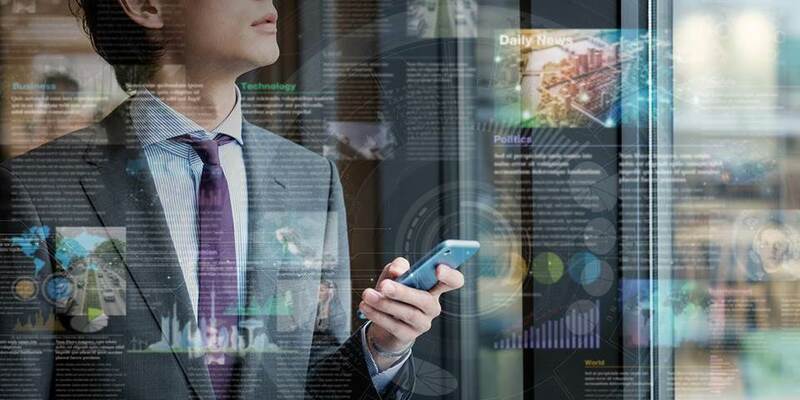 Regulators are concerned about potential problems with market liquidity because many funds promise that investors can get their money back at very short notice, even when the assets they hold aren’t that easy to sell. Since 2008, banks have lost some ability to act as shock absorbers in markets by buying up stocks, bonds or other assets from investments funds and then selling later when markets settle. This is because changes to global capital rules have made it much more expensive for banks to hold inventories of financial assets. However, there is an added dimension to the rule changes, which recent bank results illustrate. When markets tumble, an important measure of how much money they could lose in any given day—known as Value at Risk (or VaR)—tends to increase. That leads to a rise in the amount of capital banks must have in place to cover market risks. 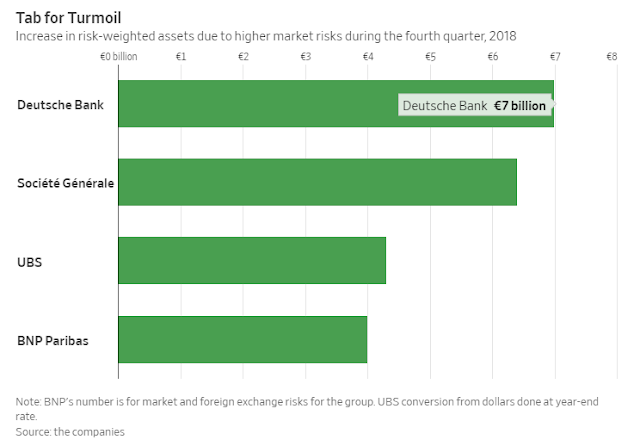 Deutsche Bank AG, Société Générale S.A. and UBS Group AG all pointed to a rise in market-risk-related measures of their risk-weighted assets, which is the balance sheet calculation used to set capital requirements. Analysts at RBC Capital Markets pointed to this increase in market risks as the reason for several banks missing their targets, or investor expectations, on year-end capital ratios. Several U.S. banks also reported a rise in the amount of market value their businesses could lose in a single day. But it didn’t have the same effect on capital at JPMorganand Citigroup ,for instance, because of other cuts to assets in their markets businesses. But for all banks, the pain of higher capital charges due to falling prices incentivizes them to take less market risk just when investors will want banks to act like strong market makers and help them get the cash they need to repay clients. This is a problem for central banks, too. When the next market crisis comes, they may have to become market-makers of last resort. Supporting the whole financial system directly in this way will likely look a lot more complicated and risky than doing it through banks, and some politicians may fight to stop it happening. That will be painful for everyone. “The gold is the property of the Italian people, not of anyone else,” Mr Salvini, deputy prime minister and leader of the League party, said in comments to reporters on Monday. The comments came after he called for the removal of the leadership of the Bank of Italy for failing to prevent the country’s banking crisis, prompting Giovanni Tria, economy minister, to defend the independence of the central bank. Italian media reports have suggested that the coalition government, formed of Mr Salvini’s anti-migration League and the anti-establishment Five Star Movement, were considering using part of the central bank’s gold to fund their spending plans. Mr Salvini said he had not studied the notion of selling Bank of Italy reserves to fund additional government spending in detail, but that “it may be an interesting idea”. Claudio Borghi, a Eurosceptic League member of parliament and close economic adviser of Mr Salvini, has proposed a law to ensure that the Italian state was recognised as the ultimate owner of Italy’s gold reserves rather than the Bank of Italy. “Nobody wants to sell the ingots, in fact, quite the opposite, we want to prevent others from having their hands on it,” Mr Borghi wrote on Twitter after Mr Salvini’s comments. Beppe Grillo, the comedian and co-founder of Five Star, last September suggested that Italy could sell off gold to fund higher state spending. The Bank of Italy has the third-largest central bank holding of gold reserves in the world after the US and Germany, owning 2,452 tonnes at the end of the third quarter of last year, according to the World Gold Council. Mr Salvini also played down the possibility of instability within Italy’s populist coalition after his League party swept aside the Five Star Movement in regional elections held on Sunday. Mr Salvini said “nothing changes” in the coalition after a regional vote in the small Abruzzo region in central Italy saw a rightwing coalition candidate supported by the League take 48 per cent of the vote. The campaign in Abruzzo, which has a population of just 1.3m, has generated more domestic attention than usual as a curtainraiser for May’s European elections which will see Mr Salvini and Five Star, led by Luigi Di Maio, battle each other for votes at a national level. Five Star’s candidate came in third, trailing the centre left with just 20 per cent of the vote or half the level it achieved in the region in last year’s general election. “It’s a vote in Abruzzo and I don’t think our Five Star friends have anything to fear,” Mr Salvini said, as he moved to play down speculation that the result could intensify intra-coalition tensions. Since Five Star and the League formed the “government of change” coalition, Mr Salvini’s anti-migration platform has helped him overtake Mr Di Maio in national opinion polls. In polling for the European elections, the League is forecast to crystallise its lead over Five Star on a national scale.